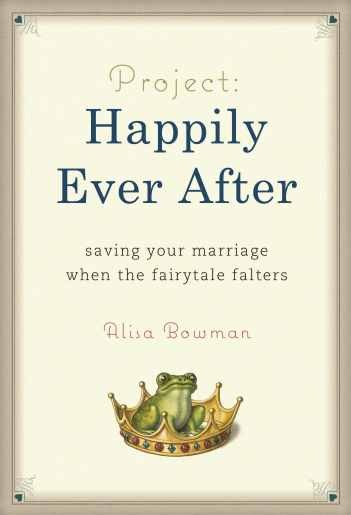 I was fortunate to receive an advanced copy of Project: Happily Ever After—saving your marriage when the fairytale falters, by Alisa Bowman. I interviewed Alisa several months ago here, and many of you expressed interest and excitement about her upcoming book. I’m happy to report the book lives up to the high expectations. Alisa delivers three important factors in this memoir-style marriage book: entertainment, education, and hope. The premise: Alisa began her marriage with a man who seemed to adore her, but who then appeared to mutate into an apathetic, unhelpful husband and father. Alisa started to dream about his death, because then she wouldn’t have to divorce him, and she and her daughter could go on with their lives. Suffice it to say the book is honest—much more honest than I would have the courage to be if I were in her shoes. Things get interesting when she is convicted by a friend who asks her what she is doing to save her marriage. When she realizes she hasn’t lifted a finger, and in fact hasn’t even been sharing her feelings of despair with her husband, she starts on a quest to read a pile of marriage books and implement their suggestions. The book includes many of her learnings and how their implementation helped improve their marriage. For couples who may have lost that early spark in their marriage, or even for individuals who are considering divorce or separation, Project: Happily Ever After is an important read. She doesn’t advocate staying in any marriage, but she does give plenty of tips for figuring out whether yours is worth staying in. Did I mention it’s funny and entertaining? Well, if you read Alisa’s Project: Happily Ever After blog, you won’t be surprised by this fact. She tackles any topic with wit and her trademark honesty. The book is available for pre-order here and will be coming out next month. Get your copy while it’s hot off the press! Watch Alisa’s sweet video here, and learn about how her falling-out-of-love story turned into a falling-back-in-love story. Even though I’ve already read a free copy of the book, I plan to buy another copy in hopes of helping another marriage. Alisa even sweetens the deal by offering a free 81-page e-book for anyone who orders by January 31st. Along with the free book, you can enter to win a free Kindle, a romantic get-away, and more. Find the giveaway details here. I want to congratulate Alisa for succeeding in both the marriage journey, as well as the publishing journey! This entry was posted in Books, Divorce, Family, Love, Marriage, Relationships and tagged Alisa Bowman, Communication, communication in marriage, Family, improve marriage, Love, Marriage, prevent divorce, Project Happily Ever After, Save Marriage. Bookmark the permalink.